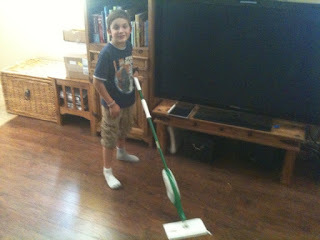 My Little Patch of Sunshine: Review: Libman Mop and Giveaway! I dread many... but my wood floors are not cleaned often enough because I have to have spray bottle in one hand and mop in the other... this is great that I can pour my hardwood floor cleaner in the container.. this would be perfect. Hmmmm. I think scrubbing the SHOWER is my least favorite job. Cleaning the toilet comes a close second :0! Laminate floors are easier to be cleaned. No scrubbing ot vacuum needed. Carpet cleaning has been always very difficult for me. That's why replace old capret with new laminate floor :).